These Mexican cocktails are savory instead of sweet. It's called a Michelada, which is like the Mexican version of a Bloody Mary. And they're fabulous! This batch makes up enough for a crowd, so it's great for parties. Cilantro is not typical here, but my husband loves cilantro so we added it. But you can certainly leave it out. Enjoy! Mix together the Clamato, beer, lime juice, Worcestershire, Maggi seasoning, Tabasco or hot sauce, and cilantro, if using, in a large pitcher. Mix together the salt and chili powder. Rub the rims of glasses with lime wedges and dip the rims into the salt and chili powder mixture. 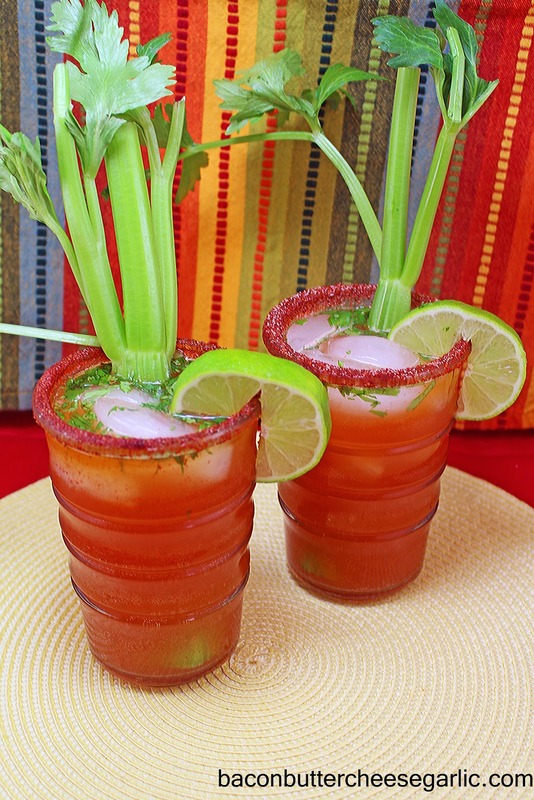 Serve the drinks over ice with extra hot sauce, if desired, lime wedges, a sprinkle of the salt and chili powder mixture, if desired, and the celery stalks. I created this recipe for my beautiful 17-year-old daughter. 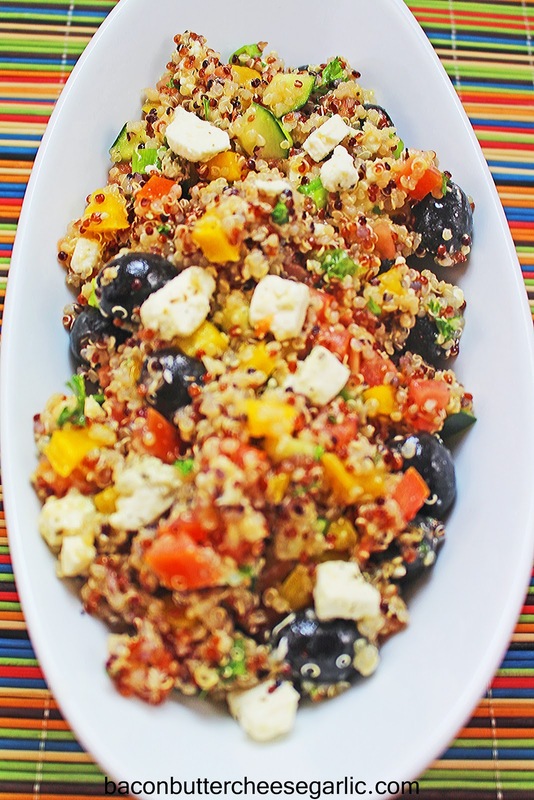 She is a huge fan of Tabbouleh, and this Mediterranean Quinoa Salad has a lot of similarities. This is simple, healthy and darn tasty! Put the quinoa and the water in a pot and bring it to a boil. Cover the pot, reduce the heat, and cook for about 15 minutes or until the water is gone. Let it cool to room temperature. Whisk together the olive oil, parsley, vinegar, oregano, juice of the lemon, and salt & pepper to taste. Stir the quinoa, the dressing, and the remaining ingredients together. You can eat it right away or refrigerate it. This tastes even better the next day! I've never had the opportunity to eat food from a food truck, but I'm just dying to try it. My husband and I love to watch shows about food trucks and have even tossed around ideas for our own food truck just for fun. We thought we'd call our truck Blondie's Tacos. We imagined an exaggerated blonde character painted on the truck. And, since we love Tex-Mex food so much, tacos are an obvious choice. I'd have carnitas and carne asada and fajita tacos as well as breakfast tacos. I think it would be so much fun! But that probably will never happen, so it's back to reality we go. Have you ever watched The Great Food Truck Race on Food Network? If you haven't, it's a competition where contestants drive food truks around the country and compete in challenges to earn their own food truck. It's a great show. The city we live in has only recently passed a law to allow food trucks, but there hasn't been a big boom of people starting them up yet. From watching those shows, we've learned that a lot of them are Bahn Mi trucks (pronounced "bawn me"). 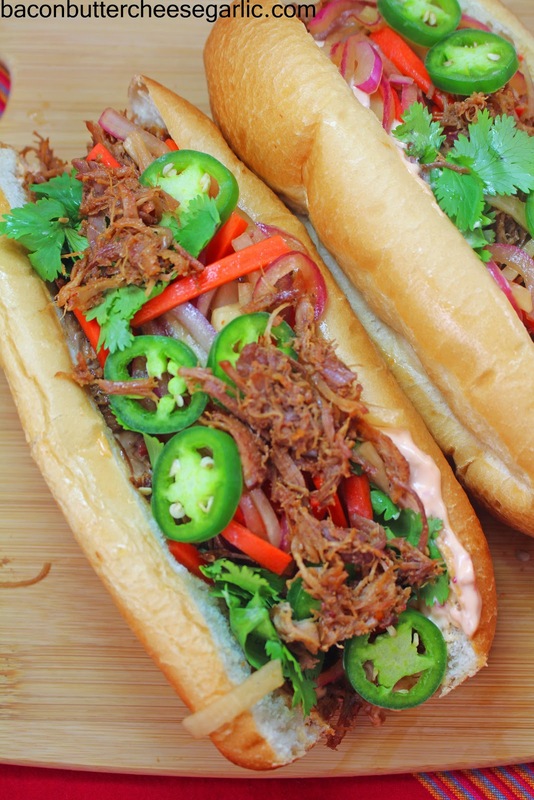 A Bahn Mi is a type of Vietnamese sandwich that typically has some type of meat, a pickled mixture of carrots, onions, and radishes, mayo, and garnished with cilantro and jalapenos. The meat varies from pork meatballs, shredded pork, or even chicken or cold cuts. I'm sure a lot of them are authentic, but I'm willing to bet that they are largely Americanized. So, for my Bahn Mi Sandwiches, I decided to borrow from the Tex-Mex culture and cook the pork the same way I cook carnitas. This process is really an amazing one. You cook the meat on the stove submerged in liquid and other flavorings until the liquid is almost gone. Then you put the pot into a very hot oven covered and let the meat fry in its own fat which produces a beautiful caramelization on the meat and produces great crispy edges. Flavor town! I made a spicy mayo and quick pickled veggies for these sandwiches. And let me tell you, we thought these were awesome! If you can't find a Bahn Mi truck near you, now you can make your own! NOTES: The chili paste is easily found in most grocery stores in the Asian section. It is also sometimes called chili sauce. It is not the same as the Heinz brand of chili sauce which is horseradish based. The Japanese 7 spice is something that I can only find in an Asian grocery store. You can substitute Chinese 5 spice which is found in most grocery stores. I found the miso paste in a higher end grocery store in town in the refrigerated part of the produce section. It is not necessary, but it gives a good flavor. I found the daikon radish in the higher end grocery store too. It looks like a large white carrot. For the crispy pork, put all of the pork ingredients into a large ovenproof pot or dutch oven that has a lid. Bring the pot to a boil and then slightly reduce the heat. Boil uncovered until most of the liquid has cooked out, about 1 to 1 /2 hours. Preheat the oven to 450 degrees. Cover the pot and put it in the oven. Cook the pork for about 30 minutes or until the pork is well browned and crispy on the edges. Let the meat cool enough where you can shred it. While the meat is boiling, mix together the spicy mayo ingredients and put it in the fridge until you are ready to use it. For the pickled veggies, put the daikon radish, carrots, and onion in a bowl. Put the rice wine vinegar, brown sugar, fish sauce, and soy sauce into a small pot. Bring it to a boil and then remove it from the heat. Pour the mixture over the veggies and cover. Put the veggies in the fridge for at least an hour to cool. To shred the meat, you can use two forks and kind of just pull it apart. My husband came up with a really quick solution for this. If you have a stand mixer, put the meat in the bowl of the mixer with the batter attachment. It shreds the meat in seconds. Wrap the baguettes in foil and warm them in the oven briefly. Split the bread open lengthwise. Spread some of the spicy mayo in the bread and add in the meat and pickled veggies. Garnish the sandwiches with the cilantro and jalapeno slices. This is a fun presentation for potatoes. These Scored Potatoes and easy and the smoked paprika in the mixture gives them a wonderful smoky flavor. Preheat the oven to 350 degrees. Halve the potatoes lengthwise. Score the potatoes once lengthwise and then about three times across the short side, being careful not to cut all the way through the potatoes (see the picture). Lay the potatoes scored side up on a sheet pan and kind of open the sections up without separating them from the rest of the potato. Whisk together the butter, paprika, herbs, garlic powder, and onion powder. Sprinkle the potatoes with salt and pepper and then brush the butter mixture all over the tops of the potatoes. Bake the potatoes for 40 minutes. Remove the pan from the oven and sprinkle the cheese over the tops of the potatoes. Return the potatoes to the oven and bake an additional 10 minutes or until the potatoes are fork tender. My husband is a HUGE fan of lime and cilantro. Seriously. I think he could eat those flavors on anything, even cereal. Well, maybe not cereal. But these Cilantro Lime Shrimp are absolutely his creation and right up his alley. They are quick and easy and taste great! Put all of the ingredients except the shrimp into a blender and pulse until smooth. Pour this mixture into a large zipper bag and add in the shrimp. Marinate the shrimp for at least 30 minutes and up to an hour. If using wooden skewers, soak them in water for about 20 minutes so they don't burn on the grill. Skewer the shrimp. Preheat your grill. 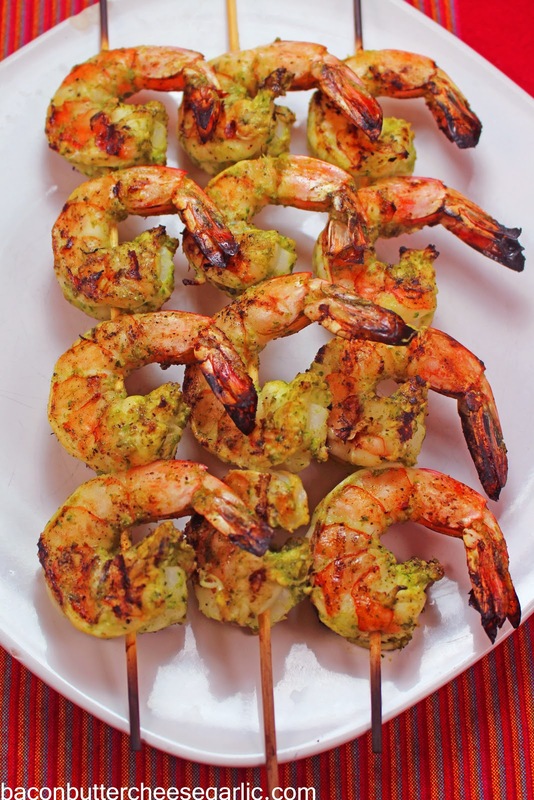 Grill the skewers over direct heat for 3-5 minutes per side or until the shrimp is done. My husband and I have been trying to perfect this Carne Asada recipe every weekend for two months. We didn't mind the trials, though, since they were all pretty good. But this one...this is the one! We both agreed that it is restaurant quality. It has the perfect marinade and the perfect charred/caramelized crust. There is a little science behind the marinade. Skirt steak can be a little chewy if it isn't handled right. We marinated it overnight for about 24 hours to get as much flavor in it as we could. The juice from the limes and orange helps to break down the fibrous meat. The soy sauce is a trick used by many restaurants to add flavor to meat. Don't worry. It doesn't taste like soy sauce. The sugar and the baking soda help the meat to brown and caramelize. And the cornstarch also helps to tenderize the meat. The result is a very tender, juicy steak. I hope you enjoy this as much as we do! Next you will want to take a stainless steel meat tenderizer (or use a fork) and pierce the meat all over. I know a lot of people think that's a big no-no. We are trying to get the marinade deep into the meat, and it also helps to soften up the fibrous connective tissue. Cover the pan with plastic wrap and refrigerate overnight, up to 24 hours. You will want to set the steak out on the counter for at least an hour to bring it to room temperature before cooking. Pat the steak dry before putting it on the grill. When you are ready to cook the skirt steak, heat your grill up to high heat. You will want to sear the steak over direct heat for 4-6 minutes per side or until you get that deep charred/carmelized surface. If you want to keep cooking the steak to well done in the center, move the steak over indirect heat to finish up the interior. We use a touch test for our desired doneness, but if you aren't comfortable with that, use a meat thermometer to judge the doneness. Remove the steak from the grill and cover with foil. Let the meat rest for about 10 minutes before slicing against the grain, which means against the lines of the steak and not with the lines. Serve the steak in tortillas with cheese, salsa or pico de gallo, a squeeze of lime juice, and guacamole, if desired. If you use a lot of social media outlets, then you've probably seen the posts about all the things you can do with a waffle iron. 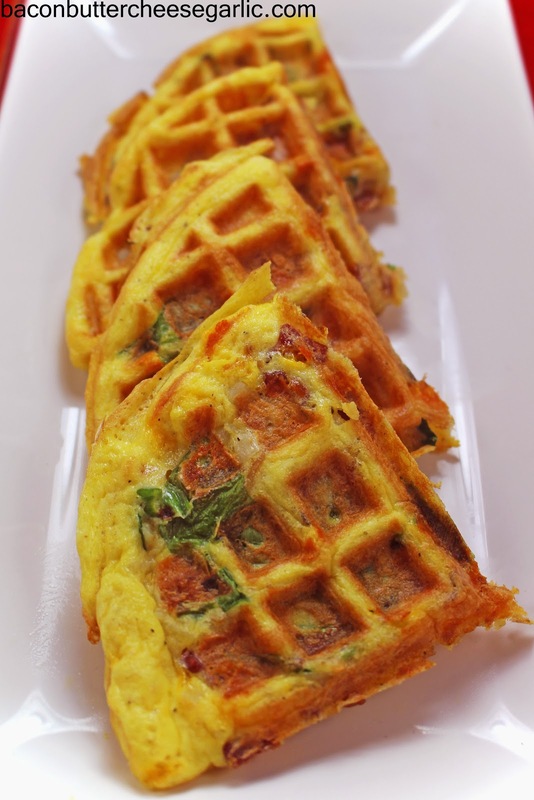 So why not make a frittata in a waffle iron! A Frittaffle! It's easy and yummy! And you can certainly mix and match the ingredients here and add peppers, mushrooms, you name it! Cook the bacon until crisp. Drain it on a paper towel and set it aside. Meanwhile, coat the bottom of a skillet with the vegetable oil. Heat the skillet to medium high heat. Spread the hashbrowns in a single layer in the skillet. Cook the hashbrowns (don't disturb them or stir) about 6 minutes before flipping them over to brown the other side. Cook the other side about 4-6 minutes or until they are browned. Preheat your waffle iron. Whisk together the eggs and salt & pepper. Stir in the cooked hashbrowns, the bacon, the spinach, cheese, and green onion. Spray the waffle iron with nonstick spray. Pour 1/4 of the mixture in the center of the waffle iron. Cook the Frittaffles about 4-5 minutes or until they are browned. This makes four Frittaffles, so spray the iron again and cook the remaining three Frittaffles. Do you have someone in your house that always uses the big spoon and fork, you know, the two oversized utensils in our silverware sets that are actually serving pieces? Well, my son likes to use them to eat with. Everyone in my house loves my homemade Mac & Cheese. But it blew their minds when I made this version with tortellini instead of pasta. 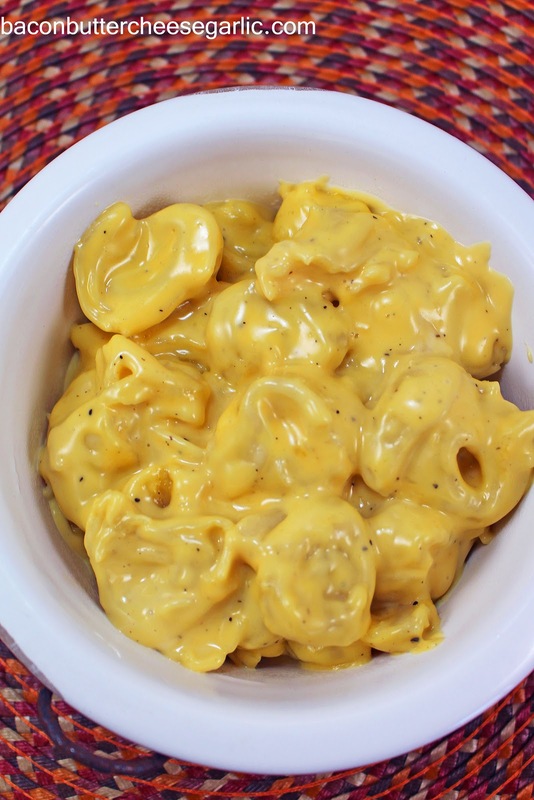 Tortellini Mac & Cheese. Makes you want to eat it with the big spoon, huh! Cook the tortellini according to package directions. Drain the tortellini and return it to the same pot you cooked it in. Add in the Velveeta, cream, butter and salt and pepper, if desired. Very carefully stir (so you don't tear the tortellini) the mixture over low heat to melt and incorporate. Serve hot. My husband and I have been obsessed lately with beef. Perfectly caramelized, tender, flavorful beef. Awhile back, we were obsessed with perfecting the perfect Steaks au Poivre, which means steaks in peppercorn sauce. 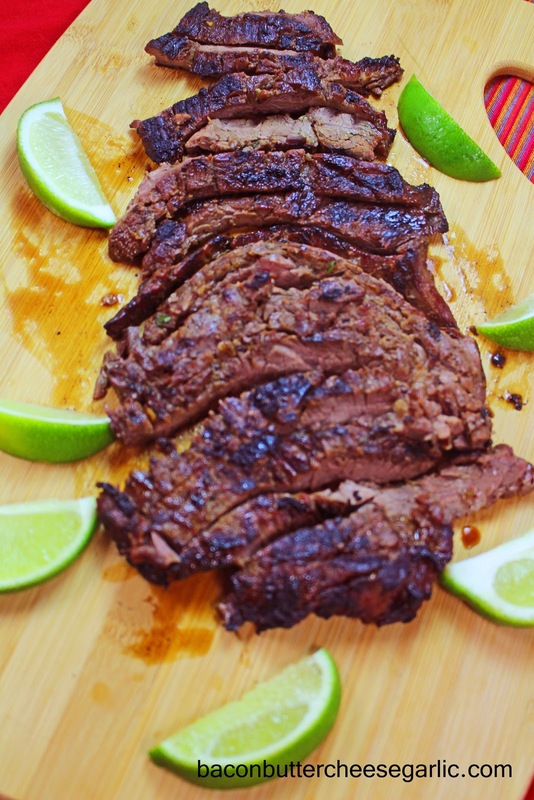 Currently we are obsessed with trying to accomplish the perfect Carne Asada recipe. We seriously have done it every weekend for several weeks. We have the marinade down almost perfect. We have the grilling down almost perfect. We just want to try another method for tenderizing the meat. I can't wait until we get it right and I can share the recipe. Anywho, here is a recipe that I only had to do one time and I thought it was perfection. 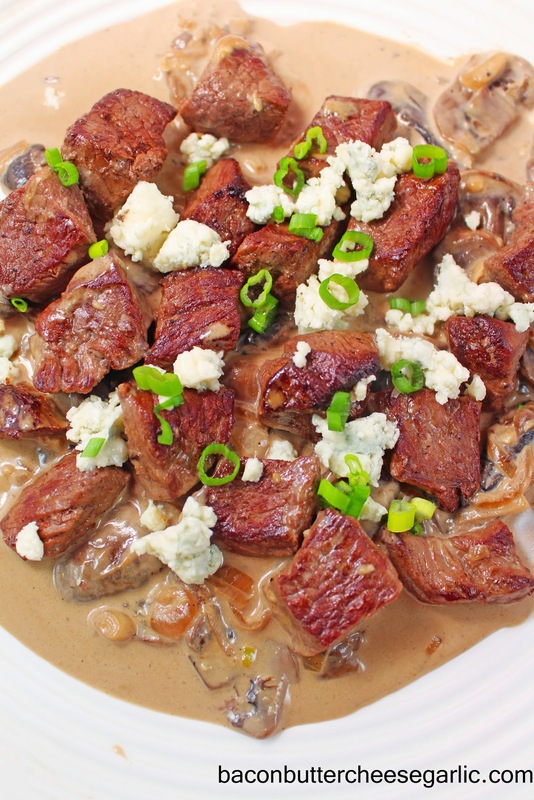 This is my Steak Tips in a Mushroom & Blue Cheese Sauce. There are caramelized shallots and mushrooms in this dish. The slightly creamy and tangy sauce goes great with the beef. The secret to this recipe is getting your pan screaming hot and searing the meat well on all sides. It was perfect tender beef in a beautiful sauce. And it was really quick and easy to do. I think this recipe would be great for date night! And it's darn tasty! NOTE: I couldn't find actual steak tips in the store, but I know they exist. I bought some very lean and affordable sirloin steaks and cut them into about 1-inch cubes. Also, I truly believe a cast iron pan is the best for searing meat. It can be done in other pans, but you may need more butter or olive oil. Preheat a large skillet over high heat until it is very hot. Add the butter into the skillet and drizzle in some olive oil. Add in the meat and sear until it is well browned on all sides. Don't mess with the meat too much in the beginning or you will tear the meat. When the meat is browned and ready to move, you should have no problem turning it. When the meat is browned on all sides, spoon it out of the skillet and put it on a plate. Cover the plate with foil to keep the steak warm. Reduce the heat to medium high. Add in the shallots and mushrooms and cook until they are browned and tender. Deglaze the pan with the red wine and cook until most of the liquid has cooked out. Add in the beef broth, garlic, heavy cream, and 3/4 C of the blue cheese. Cook until the sauce starts to bubble and get thick. Taste for salt and pepper and season accordingly. Remove from the heat and stir the steak tips into the sauce and serve with the remaining blue cheese crumbles and garnish with the green onion slices. 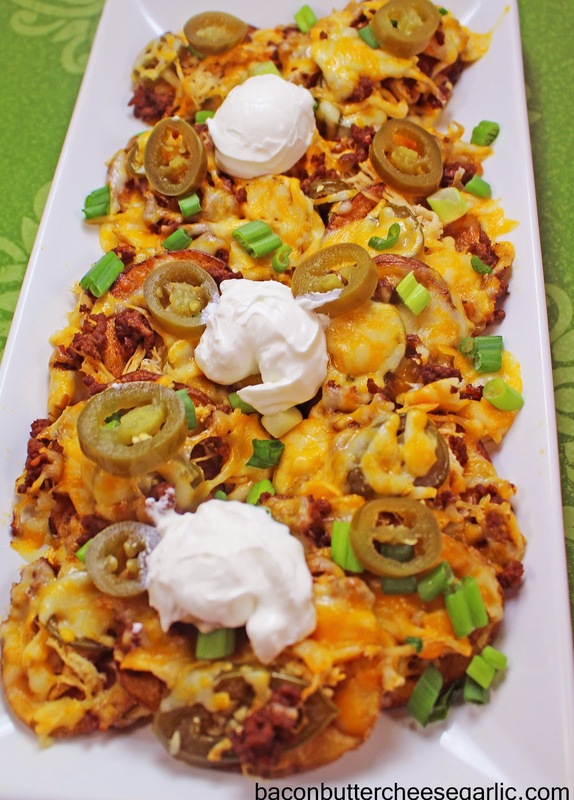 What are Irish Pub Nachos, you ask? Why, they're nachos with fried potatoes instead of chips. And they're fantastic! You can really customize the toppings the way you want here too. I did shredded chicken, taco meat, cheese, sour cream, jalapenos, salsa, and green onions. Enjoy! NOTES: I used a mandolin slicer to slice the potatoes thin, but you could use the slicing side of a box grater too. Also, I actually cooked 1 pound of taco meat and just saved the leftovers for the kids to eat in tortillas the next day. Put the chicken breast in a pot and boil with seasonings like cumin, garlic powder, onion powder, and chili powder. Boil until the chicken is done through. When it is cool enough to handle, shred it. Brown the hamburger meat and then add the taco seasoning according to the directions. Meanwhile, preheat some peanut oil in a large skillet to medium high heat. Fry the potato slices in batches until they are crispy and browned. Drain them in a single layer on paper towels. Preheat the broiler. Lay the potato slices out in a single layer on sheet pans. Top them with the shredded chicken, taco meat, and cheese. Put the pans under the broiler to melt the cheese and warm everything else up. Serve the nachos with the sour cream, green onions, and jalapeno slices. My favorite day of the week is Sunday. For one, it's my only day off at work. But it's also a day that we all try to spend together. We usually start off the day with letting Cooper, our Boxer, come in the bedroom with us to play. He loves to jump on the bed and "box" my husband and tries to bite his head, playing of course. We almost always cook breakfast together and it's the only day of the week that the four of us get to eat breakfast together. We usually cook a big feast for dinner on Sunday night and a lot of times that involves grilling now since we have a new grill. It's a day to relax, enjoy each other, and have a little fun. Sometimes we even play Skipbo or other games. If it's summertime, we are definitely in the pool. I also really value these days because our children are nearing adulthood. Our daughter is 17 and our son is 14, both of whom are taller than me. Our son likes to go to the grocery store with me only so that he can tell me I'm too short and he can reach the stuff on the top shelves. Our time with them at home is getting shorter and shorter. While I look forward to having a clean, quiet house, I'm sure I'll miss them a lot when they move out. I like to cook a wide variety of many different things, some of which the kids don't like. But sometimes I try to give them something simple that I know they will love. 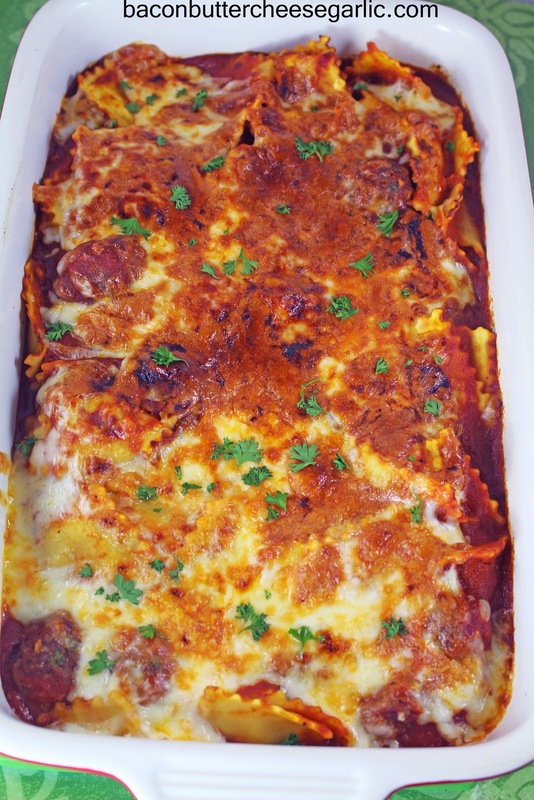 Like this Meatball Ravioli Bake. It's really simple to throw together and doesn't take all that much time. I made the meatballs and the sauce homemade, but you can take shortcuts and buy a good quality frozen meatball and use jarred marinara sauce. If you have kids or are a big kid yourself, everyone will enjoy this dish. Preheat the oven to 350 degrees. Mix all of the meatball ingredients together except the olive oil. Shape them into 1/2 to 3/4 inch meatballs. Put them on a sheet pan or in a casserole pan. Drizzle them with a little olive oil. Bake them for 20-25 minutes or until the meatballs are done. Meanwhile, cook the ravioli according to the package directions and warm the marinara sauce. Drain the ravioli. Since the weather is finally warming up some, the produce section at the grocery store is looking a little better. I saw these fat squash and knew I had to do Bruschetta Squash! 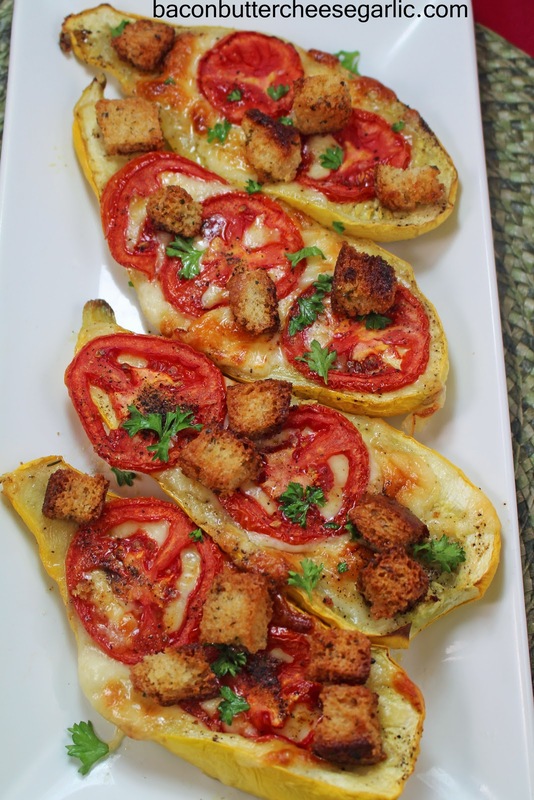 Baked squash tastes so good with a little garlic, Mozzarella cheese, basil, fresh tomatoes and homemade croutons! Yummy! Preheat the oven to 400 degrees. Mix the butter, garlic powder, herbs, and seasoned salt together in a bowl. Cube the bread into small cubes. Toss the butter mixture together with the bread cubes. Spread them out on a baking sheet and bake the croutons for 7-12 minutes or until they are browned and crunchy. Set them aside and leave the oven on. Scoop a bit of the seeds out of the squash with a spoon. Drizzle a little bit of olive oil over each squash and season the insides with a bit of salt and pepper. Bake the squash at 400 degrees for about 15 minutes. Remove them from the oven. Turn the broiler on. Spread a little of the garlic into each squash half. Add 1/4 of the basil to each squash along with 1/4 of the cheese in each squash half. Top the cheese with the tomato slices. Put the squash under the broiler and broil about 10 minutes or until the cheese is melted and the tomatoes start to brown. Serve the squash with the croutons. 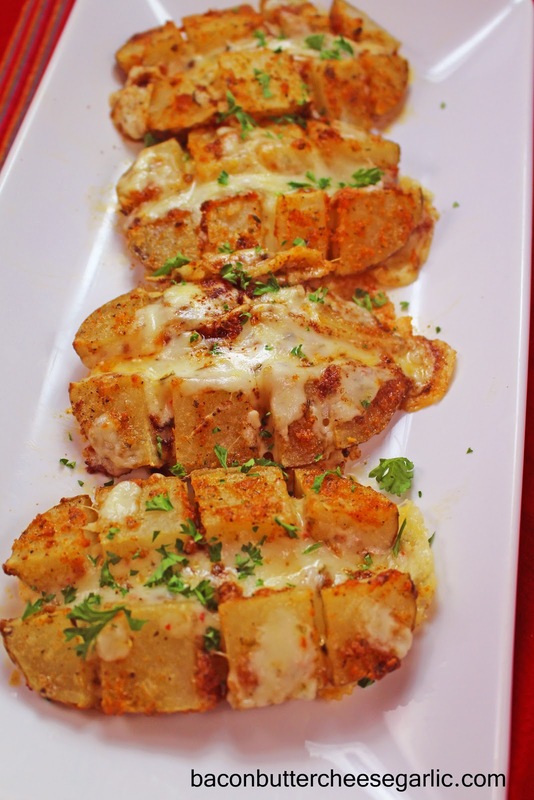 I am always looking for things to do with potatoes since they are a great side dish. 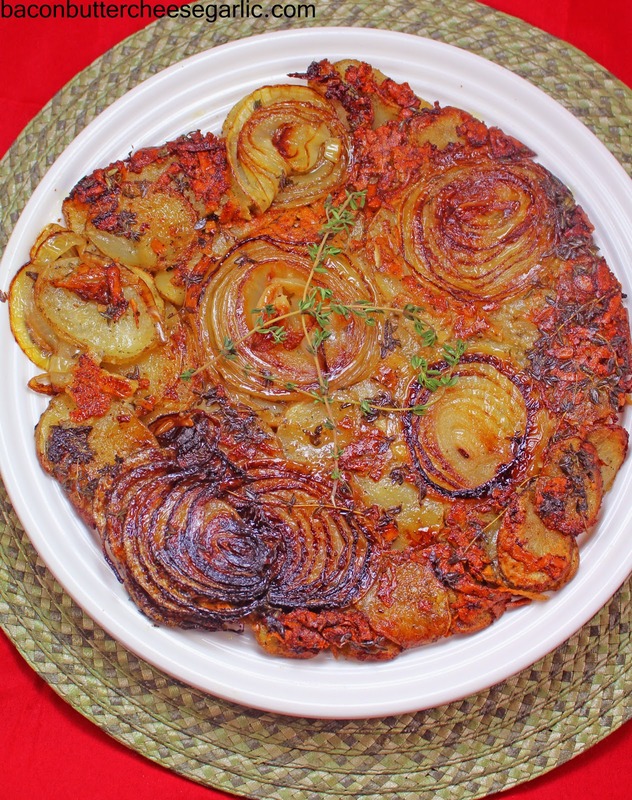 This Cheesy Potato & Onion Galette is so good. I just love how the onions caramelize on the bottom. And smoked Gruyere cheese gives it a fabulous flavor! Enjoy! NOTE: I have only made potato galettes in a cast iron skillet. I've never done it in any other skillets, so I'm not sure how well your galette will slide out of the pan. You will need an ovenproof pan if you don't use cast iron. Preheat the oven to 400 degrees. Preheat a cast iron skillet (or other ovenproof skillet) to medium high heat and melt in the butter. Place the onion slices in the skillet, making sure not to separate the rings. Pull the leaves off of the thyme sprigs and put the leaves in the skillet with the onions (discard the thyme stems). Cook the onions for around 5 minutes, turning once, or until the onions start to brown and get tender. Mix the potatoes, oil, cheese, Ranch dip mix, garlic, and black pepper together. Spread the potato mixture over the onions, trying to make even layers. Put the pan in the oven and bake for about 45 minutes or until the potatoes are tender. Place a plate on the skillet and flip it over so that the galette ends up on the plate onion side up. Okay. So a lot of you, maybe even the majority, found me through my most popular recipe, Smothered Chicken. By the way, I am so very appreciative of your support. If it weren't for all of the Facebook shares, Pinterest repins, Twitter and Instagram likes, Google + shares, and Tumblr shares, I wouldn't be able to do this. So a big thank you to all of you! Anywho, I got to thinking about the Smothered Chicken the other day and how amazing the topping of creamed spinach, mushrooms and Mozzarella cheese is. And I wondered if there was a way I could put a spin on that and add to it and make something even better. Well, my friends, I think I did just that. This is by far my favorite meal I've made in a long time. These are Italian Chicken Rolls. The creamed spinach and mushrooms are rolled up in chicken cutlets, wrapped in prosciutto ham, baked in beautiful rich marinara sauce, and topped with gooey melted fresh Mozzarella cheese. It is so darn tasty! I hope you love it as much as or even more than Smothered Chicken! NOTE: I get a lot of comments from people who have issues with getting their chicken done in the time I suggest. Please use my cook times as a guideline, as not all ovens work the same or heat the same. I would highly suggest you invest in a good meat thermometer so that you don't over or under cook your chicken. This is the most accurate way to tell if your chicken is done. You can get a good one for around $20 that has a long heatproof wire and a digital readout that sits on the counter so that you can keep the thermometer in the chicken the entire time it cooks. Chicken needs to be 165 degrees internally to serve. Also, this prevents the need to cut your chicken open to look at the inside, which causes you to lose juices. Preheat the oven to 350 degrees. Butterfly the four chicken breasts so that you now have 8 cutlets. Place the cutlets between plastic wrap and pound them out thin. Melt the butter in a large skillet and drizzle in the olive oil. Cook the mushrooms and onion until tender. Deglaze the pan with the wine and cook until most of the liquid has cooked out. Add in the spinach and cook and stir until it has wilted. Add in the cream cheese, garlic, and Parmesan. Cook and stir until the cream cheese is fully melted. Taste it and see if you need to add salt and pepper. Pour the marinara sauce into a 9 x 13 casserole pan. Put dollops of the spinach and mushroom mixture onto the center of each piece of chicken. Roll them up. Wrap each chicken breast with a piece of prosciutto. Put the chicken seam-side down into the marinara sauce. Cook for 40 to 45 minutes or until a meat thermometer in the center of the chicken registers at 165 degrees. 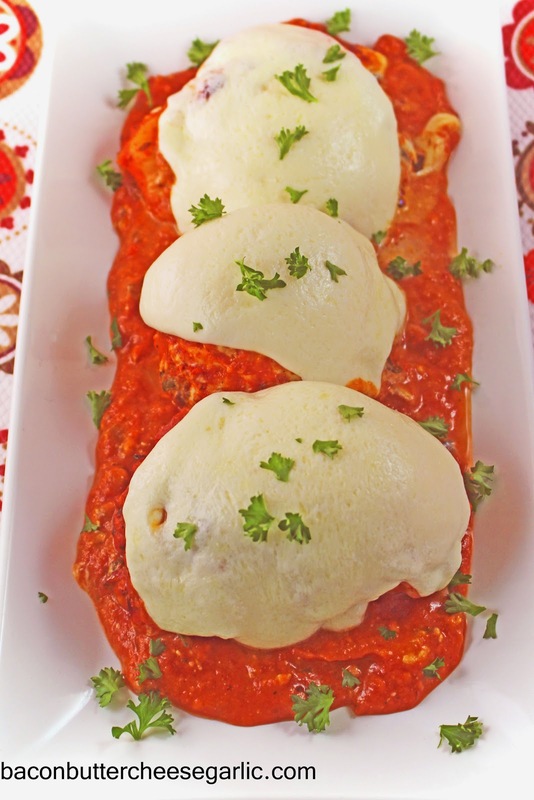 During the last few minutes of cooking, place a slice of Mozzarella over each piece of chicken and put it back into the oven to melt. This is a very old, handed-down recipe for Blackberry Cobbler. The tarts berries work really well against the sweet cake-like cobbler. It's my daughter's absolute favorite dessert. NOTE: I made this in a 9 x 13 pan. You can make it in an 11 x 7 pan as long as the pan is deep. The cobbler rises up quite a bit and may spill over without high sides. Also, even though the blackberries are poured on top of the batter and not stirred in, the batter rises up and bakes around the blackberries. Preheat the oven to 375 degrees. Put the stick of butter in your pan and put it in the oven to melt it. Put the blackberries, water, and 3/4 C sugar in a pot. Bring the pot to a boil and boil about 5 minutes. Whisk together the milk, flour, 1 C sugar, baking soda and salt. Pour the batter mixture over the butter, trying to coat the entire pan. Do not stir the batter into the butter. Next, carefully pour the blackberries and liquid over the batter. Do not stir the blackberries into the batter. 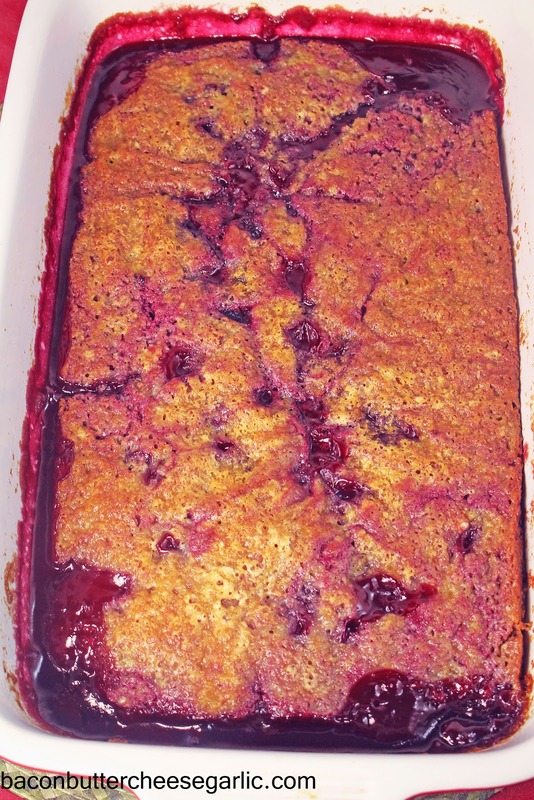 Bake the cobbler from 40 to 50 minutes or until the cake is browned and cooked through. This cannot fully be enjoyed without some vanilla ice cream. Snow days are the pits. I truly absolutely despise winter. And snow. It's cold and wet and yuck. I am a total summer girl. I'd much rather be in shorts and flip-flops than trudging around in snow. We have had several days in a row of snow, sleet, freezing rain, freezing fog, freezing cold. The roads thaw slightly during the day and then freeze back up at night, which makes the drive the next day rather interesting. There aren't a lot of snow plows in Texas, so our towns are quite ill prepared to deal with frozen, snow covered roads. I have managed, though, to get around and get to where I need to be. Until Saturday. I went to work, ran some errands, and came home. I gathered up my purse, my groceries, my iced tea, and headed to the door to go inside. On my very last step of sidewalk before reaching the dry front porch, there was a huge patch of ice. I stepped on the ice and started slipping. That's when I did that little dance people do when they're trying not to fall. The thought in my head was, I don't want to fall. I don't want to fall. And then the thought was, I'm going to fall. It's almost like, during the few seconds that I was battling it, that I eventually gave up and was prepared to fall. And I did. Hard. As I hit the ground, I said a word that's not very nice. My husband heard the fall and the not nice word and came outside. It was all rather unpleasant, and the huge knot and 8-inch bruise on the back of my leg aren't very fun either. Ice 1, Cindy 0. 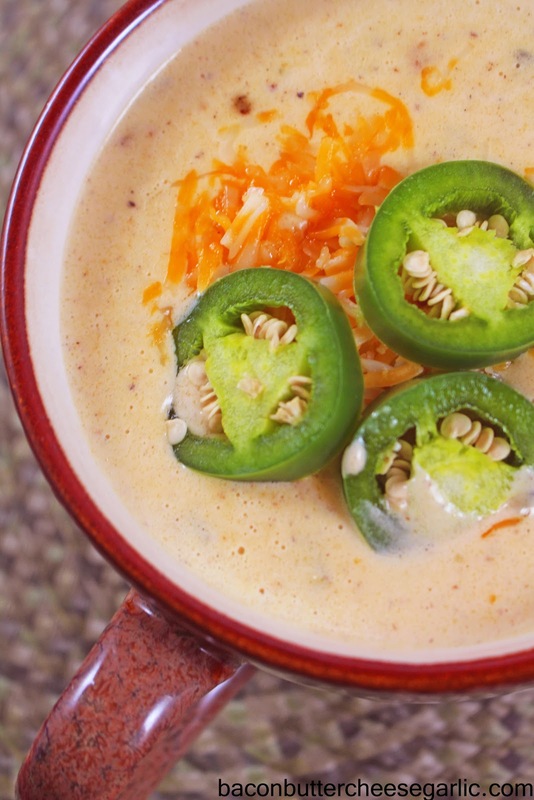 So I decided to make Jalapeno Beer Cheese Soup for dinner that night. It's warm, comforting, and has 3 of the New Four Food Groups in it. And it was good. Although I could only sit on one side of my rear end to eat it. NOTE: The chicken stock, bacon, and cheese lend a lot of saltiness to this soup. You will want to taste it before adding any salt. I found that I didn't need to add any at all, and I'm a salt addict. In a large pot or dutch oven, cook the bacon until crisp. Drain the bacon on a paper towel and crumble it. In the same pot in the bacon grease, cook the onion and jalapeno until tender. Add in the beer and the garlic. Bring the beer to a boil and cook and reduce until most of the liquid has cooked out. Add in the butter and let it melt. Sprinkle the flour over the veggie mixture. Stir the mixture and then add in the chicken stock. Whisk to combine. Let the mixture start to bubble and then add in the heavy cream and the mustard. Bring the soup to a boil. Turn the heat off or to very low and whisk in the cheese in handfuls until it melts completely. Stir in the cooked bacon and serve. If my husband had his pick between a jalapeno and a serrano, he would pick the serrano every time. While they look similar and sort of taste similar, there are some differences. 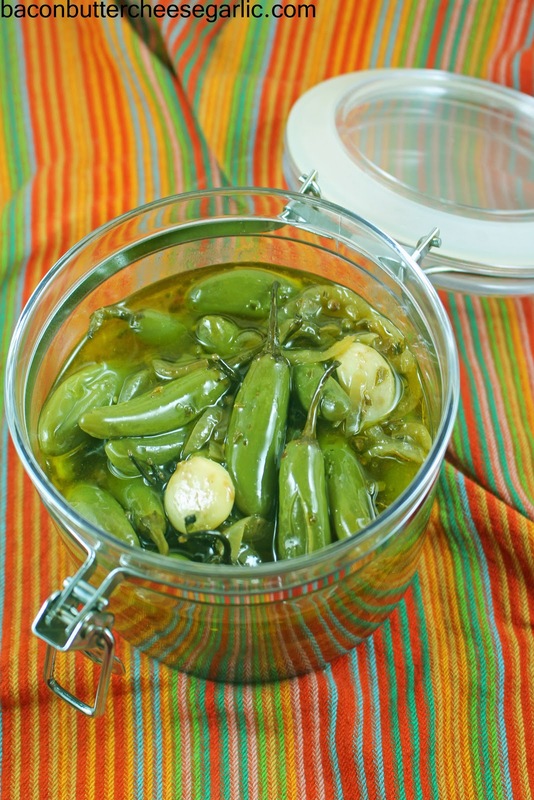 Serranos are smaller than a jalapeno and pack a little bit more heat. Serranos are also said to have a slightly grassy and citrusy flavor, while the jalapeno is said to have a fruitier flavor. For us, the seeds of the jalapenos are slightly too large and can be bitter to bite into, whereas with a serrano the seeds are smaller and we usually leave them in whatever dish we are using them for. We love using the serrano pepper in our fresh Pico de Gallo. So he asked me if I could pickle some serranos for him. Well, of course I can! We found that the pickling process here sort of tamed down the serranos, although we haven't eaten that many yet and I'm convinced there are a few zingers in the jar. If you are a fan of chiles, I hope you love these! Pierce each pepper once with a fork. Heat a generous amount of olive oil in a large skillet to medium low heat. Add in the onion and cook and stir constantly until the onions are tender. Add in the serrano peppers, cumin seeds, peeled garlic, mustard seeds, coriander seeds, peppercorns, oregano and bay leaf. Turn the heat up to medium high and cook and stir until the peppers start to get soft, about 10 minutes. Pour in the vinegar and salt to taste and cover the pot. Bring it to a boil and boil about 5 minutes. Remove from the heat. Carefully pour it all into an airtight container but don't cover it yet. Let it cool before covering it and putting it into the fridge. Store in the fridge a week before serving.